CLICK HERE to read an article about the Duggars' cult/religious sect, written in response to the controversy surrounding the "Taliban Dan” political ad aired in 2010 by an opponent of then-candidate, now-Congressman Daniel Webster (R-Florida). CLICK HERE to visit the blog Galatians 4 and read a lengthy post covering several issues related to the Duggars' cultic beliefs, including the truth behind the Duggar family's happy façade, the pitfalls the Duggar children will likely encounter as adults, and the Duggars' support of the controversial (and arguably abusive) parenting techniques (including blanket training) advocated by Michael and Debi Pearl. For more on the Pearls, view #1 on THIS LIST, and watch THIS VIDEO. CLICK HERE to visit Patheos and read a post explaining the Duggars' views on courtship and marriage. CLICK HERE to visit the blog Redemption Pictures and read a post about growing up in the Duggars' cult. CLICK HERE to read an archive of a post about the Duggars' cult/religious sect, from the now-defunct blog Wide White. Click HERE and HERE to read about the Duggars' cult/religious sect on the blog Under Much Grace. Click HERE, HERE and HERE to read about the Duggars' cult/religious sect on the website No Longer Quivering. CLICK HERE to order A Matter of Basic Principles: Bill Gothard and the Christian Life, the seminal text on the Duggars' cult/religious sect. CLICK HERE to order the Kindle edition. CLICK HERE to order the NOOK edition. CLICK HERE to order I Fired God: My Life Inside---and Escape from---the Secret World of the Independent Fundamental Baptist Cult (Kindle version, Nook Version), Jocelyn R. Zichterman's account of surviving the institutionalized child abuse endemic to the Independent Fundamentalist Baptist (IFB) denomination/cult. The Duggars' cult (Gothardism) is merely one branch on the IFB tree. CLICK HERE to watch an ABC 20/20 exposé on the IFB. Learn more about the IFB at BaptistDeception.com. CLICK HERE to read articles about the Duggars' cult/religious sect, written by Midwest Christian Outreach, the faith-based anti-cult organization that authored A Matter of Basic Principles. CLICK HERE to visit a website created by and for survivors of the Institute in Basic Life Principles and the Advanced Training Institute. The Institute in Basic Life Principles, or IBLP, is the organization behind the Duggars' cult/religious sect. The Advanced Training Institute (also known as the Advanced Training Institute of America and the Advanced Training Institute International), or ATI, is the homeschooling division of IBLP. CLICK HERE to visit the Duggars' official website and see pictures of the family at a regional ATI conference (episodes 31, 79, and 128 of 19 Kids and Counting show the Duggars attending these conferences). 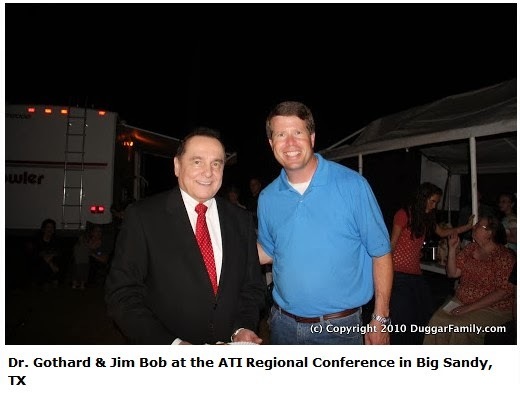 A few of the Duggars' ATI conference photos are particularly noteworthy: THIS picture shows family patriarch Jim bob Duggar with ATI/IBLP founder/cult leader Bill Gothard (UPDATE - March 2014 - This photo was removed from the Duggar's website after Bill Gothard resigned from ATI/IBLP as the result of a sexual harassment scandal). 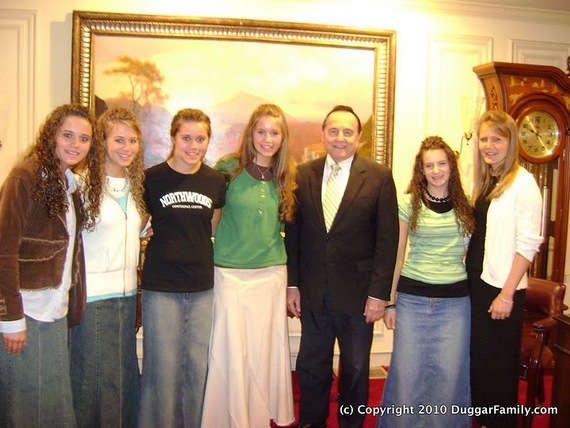 THIS picture shows the four oldest Duggar daughters with Bill Gothard. There are also a few pictures (EXAMPLE 1, EXAMPLE 2) of the Duggar boys wearing ALERT Cadet uniforms. ALERT (Air Land Emergency Resource Team) is ATI/IBLP's paramilitary program for male graduates of the ATI homeschooling program (CLICK HERE to watch the official ALERT promo video). The ALERT Cadet program is a Boy-Scouts-like program that introduces younger boys to the skills they'll need as full-fledged ALERT members. CLICK HERE to visit Anna and Josh Duggar's website and see a list of ATI/IBLP "Resources for Families." Josh and Anna met at an ATI conference. CLICK HERE to read Michelle Duggar's tips for a happy marriage. CLICK HERE to read how she spends time with her kids. CLICK HERE to find more information about the Duggars' cult/religious sect on Google. DID YOU KNOW? The Duggars' cult/religious sect teaches that a woman should not seek higher education; should not work outside the home; should, as an adult, remain under the authority of her father until her father approves a husband for her; and should be held responsible for ensuring, through her actions and manner of dress, that the men around her do not think lustful thoughts (that's why the Duggar women wear swimsuits that look like THIS). FUN FACT: If all of Michelle and Jim Bob Duggar's descendants succeeded in procreating at the same rate as Michelle and Jim Bob (something their beliefs dictate as a spiritual imperative), Michelle and Jim Bob would have 16,983,563,041 great, great, great, great, great, great grandchildren (approximately 2.5 times the current population of the Earth) in the year 2208. Thanks to the Duggars, the world population would be almost 2.7 times current projections for that year, and almost 75% of the Earth's population would be direct descendants of Michelle and Jim Bob. Michelle and Jim Bob Duggar are part of the cult of Gothardism, which operates under the banners of ATI (the Advanced Training Institute) and IBLP (the Institute in Basic Life Principles). This radical religious sect was started in the late 1960s by Bill Gothard, an evangelical preacher and self-proclaimed expert on marriage and children.